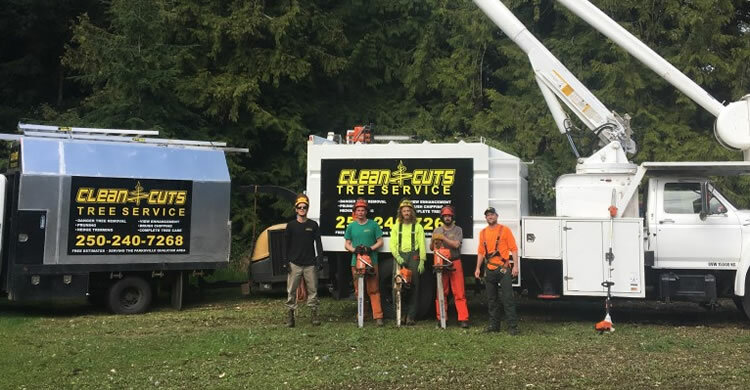 Clean Cuts Tree Service Ltd. is a local, Island-owned tree service company based out of Qualicum Beach, BC. With two trucks (including an aerial bucket truck), two wood-chippers and 5 full-time crew, we’re big enough to handle the toughest tree trimming and tree removal jobs and we’re still small enough to care about the quality of our work and the level of customer service that is often lacking in our industry. Tree service work can be dangerous, especially in our neck of the woods where much of our development is happening along coastlines or up hills and mountains. We have lots of mature timber on the Island and many of the properties in our service area have many large, mature trees on-site. We have experienced tree service crews ready to help you with your tree care issues, whether it’s trimming a massive privacy hedge with our aerial bucket truck or strategically topping some trees to enhance the views from your property, we can help. Our business is appropriately licensed, insured and we are current with WorkSafe BC so you know our workers and your property are protected. Our Mid-Island Service Areas Include: Qualicum Beach, Bowser, Parksville, Errington, Coombs, Whiskey Creek, Lantzville, and Nanoose. If you’d like to receive an estimate for our tree services from Lantzville to Bowser please give us a call 250-240-7268 or fill out our email form and we’ll get right back to you.